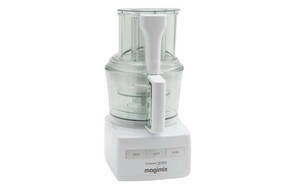 Snapshot: The Magimix 3200XL food processor has 1 speed and a storage box for attachments. How does it rate? Excellent results in our carrot-slicing, cheese-grating, pastry-kneading, breadcrumb-chopping and mayonnaise-emulsifying tests. Comes with 3 processing bowls. Large chute has a safety locking system. Very comprehensive instructions with recipes. Parts dishwasher safe using a low-temperature cycle. Fairly stable on the bench during operation (but can jolt with a heavy load). Bowl is not sealed so overfilling can lead to spills. Processor blade performs better than dough blade for pastry. 23 Jun 2018, Julia S.
Cutting yourself on it’s super sharp blades! 29 Jan 2018, Graeme W.
Amazing for doing egg whites for pav. Has a great storage system for the (very sharp) blades and bits. Really easy to use all the accessories. Big bowl is huge, i didn't realise that you can only use the large and small bowls with the blades and the middle one for for the shredding/slicing/grating discs, but now have the hang of this its fine. Super heavy means no jumping around on the bench. Some stuff from the mid bowl does fall into the large bowl so you end up cleaning both. All pretty easy clean though as long as you have cupboard space for the accessories 'bin' (like a bread box). Made to be left on the bench, wouldn't want to have to get it out of a cupboard to use it. 24 Jun 2017, Jill K.
Very good processor. Performs all tasks well. Heavy and cumbersome if you have to move it to use it. I lift mine out of the pantry onto the bench to use it and this is quite difficult. My old Braun was much lighter. I now think twice before using the Magimix. "This one was too expensive for me"
30 Jan 2016, Laraine B.
and most of the time my Kenwood Gourmet (broken down after 30 years) was big enough so I went searching for a similar replacement rather than a bigger one. No matter where I went Magimix was claimed to be the best food processor, so a little more searching found the 3150 at $398. $448 is the cheapest I can find it now. The only times a larger machine would be desirable (there are only two of us) is for processing ox heart for our dogs and making short pastry, when I invariably turn a whole block of butter into pastry and freeze what I don't want to use immediately. None that I can think of. Certainly buy the biggest you can afford, as another member recommends, because the big ones do come with two smaller bowls. The 3150 came with two bowls, one about the same size as my Kenwood and a smaller one that I find excellent for chopping onions. I have had my Magimix since early September 2013. "Buy the biggest Magimix you can afford"
22 Aug 2015, Paul & Karen C.
We bought the 5100 16 years ago, after my husband blew up his ancient food processor trying to make bread. I used it almost every day for years, & it is still working as well as new. I have replaced the bowl & lid at different times. I have made cakes, scones, mayonnaise, cole slaw & countless other things using the different blades. Only thing I wouldn't recommend is trying to whip egg whites. Can get bits left over when slicing/grating.